Last weekend I left on a jet plane and headed to Charleston, SC- one of my absolute favorite cities I have visited SO FAR in my lifetime. If you know me well you know my love for this city runs deep and I visit every single chance I get. I didn’t hesitate one second when Volvo invited me down for a weekend to explore the city with them. I mean a weekend full of luxury cars and hotels, helicopter tours, mouth watering food, and historic homes, in my most favorite city- who am I and why can’t this be my everyday life. AND let me tell you what- we made the absolute BEST of the 72 short hours we had in the Holy City of Charleston. Think of me as your personal travel agent and I’m about to tell you how to have the absolute BEST weekend Charleston experience there is. If southern hospitality, historic homes with beautiful early architectural design, and AMAZING comfort food are your thing(s)- this travel guide is for you! Charleston also has a beautiful nightlife- but honestly thats just not my thing. I’m back in my hotel room relaxing and eating fresh pralines in bed before 9 pm. I guess you can call me an old soul. Speaking of relaxing in my hotel room that brings me to my first tip of visiting Charleston and it’s where to stay. I highly recommend staying downtown. The best way to experience Charleston is planting yourself right smack dab in it. The hotels in this city are like none you will ever experience. Most of them are old historic buildings that have been transformed into luxury hotels while persevering their charm and history. THE DEWBERRY: This trip we stayed at The Dewberry and it is definitely the nicest place I have stayed in Charleston (and I’ve stayed quite a few well known places). The Dewberry is nestled right on Meeting Street amongst Marion Square and beautiful historic churches. This hotel preserves the old-world charm of Charleston while mixing mid-century modern vibes. You feel as though you have been teleported to a completely different era. The hospitality, the design, every single detail was above and beyond. The Dewberry might just be the hidden gem of Charleston’s accommodations. See more about The Dewberry here- CLICK HERE. Early to mid fall is probably my favorite time to visit. This trip was absolutely perfect- the first weekend in November. The weather this time of year is usually in the 60s and highs in the 70s range with a low humidity. In the summer it can get very hot and humid. Them hot humidity southern summer days will have you sweating and your makeup melting off. So the early spring or fall is a much more desirable time if you plan on strolling the streets. Now that you know where and when to stay let’s talk about what there is to do on a weekend trip to Charleston- besides eating because I will cover that too but I’m saving the best part for last. The main thing you want to remember is you’re only here for a weekend and you don’t want to overwhelm yourself or run around like a crazy person trying to see it all. Charleston may be a small city but there is SO MUCH you can do. So for a relaxing weekend where you don’t want to be overwhelmed but still want to get the ultimate Charleston experience this is what I recommend. Remember to take it slow, get lost in the city, and soak up the slower southern way of life. Get out and enjoy the city, have a nice dinner, and retire to your room for some r&r. THE BATTERY: Jump in your car and head to the battery. Volvo made this part extra special because we got to cruise around in style in the new S60 that hadn’t even been released yet. It’s classy yet sleek modern Scandinavian design fits right in on the streets of this historic city. If you love all things design, historic homes, architectural details, and beautiful gardens you will be in heaven. Drive around street after street or park and walk. A lot of the homes have plaques outside that tell you its history- when it was built, who lived there, and any historic significance it may have. I also recommend going back at night. Sometimes we make a loop after dinner or get out for a quick little walk- never hurts to burn some of them comfort calories off. There’s just something magical about the gas lanterns along the porches and the grand crystal chandeliers you see gleaming from inside some of the homes. HELICOPTER TOUR: When you only have a short amount of time take it to the air to see ALL of downtown Charleston with Holy City Helicopters. This was my first time in a helicopter and it was so much fun!! So I was able to see my favorite city from above and check something off my bucket list. I also got to fly over the Volvo plant and see where the new Volvo S60 is rolling off the production line. MARKET STREET: Visit the Market and make sure and stop my and get some Pralines from Market Street Sweets. 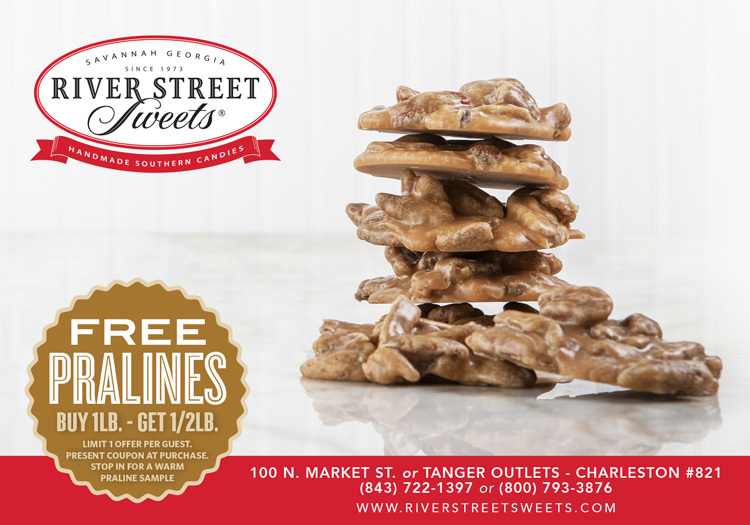 Here is a coupon for their delicious pralines- CLICK HERE. Trust me these are the best in Charleston. KING STREET: Shop all along King Street. Louis Vuitton, Gucci, Anthropologie… its like a mall strung along a street in historic old buildings. One of my favorite stores for the buildings interior architectural design is Urban Outfitters. Trust me you must see it! I don’t really “shop” I just tour all the buildings. The best part for last! I could go on and on about the food in Charleston. I honestly haven’t had a bad experience yet. So to keep it simple I’m just going to flat out tell ya my favorites. Toast- Get the Eggs Meeting Street. Taco Boy- Start off with the Appetizer Trio and then our favorite tacos are the Fried Chicken and the Carne Asada. Bowens Island Seafood- Fresh Stemmed Oysters and a fried seafood heaven. Bowens Island Seafood- We kind of dug in before I got a good picture. FANCY DINNER: *I highly recommend making reservation a couple days ahead. Fleet Landing- Beautiful water views! So this was my BEST of Charleston Weekend guide highlighting all the top things to do during a short little weekend trip to Charleston. There is SO MUCH more I could tell you about Charleston and I’m pretty sure I could do an entire in-depth travel guide for this city. I love EVERYTHING about it- the history, the food, the houses, the landmarks…. If there is anything you have questions about or want any more recommendations leave it in the comments below or send me an email. I would be more than happy to chat about my favorite city with you! Maybe one day I will have a house here and I can invite you all over for a garden party. Until then I will keep visiting every chance I get. *This post was sponsored by Volvo Cars, but as always all words, reviews and opinions are by yours truly.